Unlike other programs that have a closed group of beta testers, all 3DC builds are open to any user. We only ask in return to help us by sharing your experiences. Please use Mantis to report any bugs and discuss feature requests. Please use Trello board to vote feature requests priority. For the moment each site requires it's own login. Please don't hesitate to ask any question, your opinion to make this process better is needed and always welcome! The bug reporting and feature request forums (except for the Urgent Help section) are going away soon! 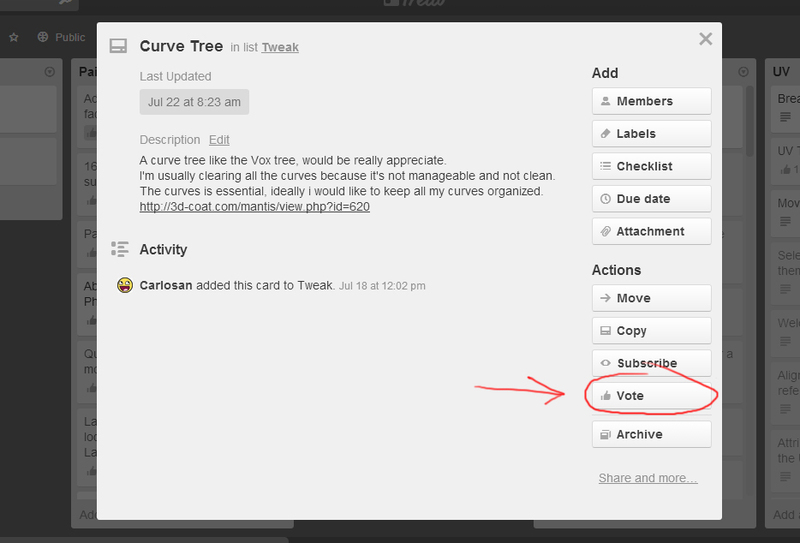 To place a vote for a feature in Trello, click on the card for the vote, and while in the card there will be some buttons on the right side. See the image below for exact placement of the "Vote" button.